Catherine Powell, Euro Disney S.A.S. President and Euro Disney Supervisory Board Member Tricia Wilber have both been awarded Diversity Journal 2016 Women Worth Watching awards. Awarded to women of purpose and drive who represent diversity within their spheres of influence, the Diversity Journal 2016 Women Worth Watching awards celebrate the achievements and personalities of leading women executives. PRÉSIDENTE OF EURO DISNEY S.A.S. As a leader within one of the world’s most admired companies, The Walt Disney Company, Catherine Powell is widely respected both internally and within international communities. Taking the reins this summer as Présidente of Euro Disney S.A.S., the management company of Disneyland Paris, Powell demonstrates boundless passion, energy and curiosity. Her colleagues say she is continually pushing boundaries and inspiring others to success. Powell is an experienced Disney leader with over 12 years in global roles throughout Europe, the Middle East, Africa, and Asia-Pacific. Most recently, she was managing director in Australia and New Zealand (ANZ), driving extraordinary growth at Disney during her tenure and leading the region to be one of the company’s top performers among developed countries. In ANZ, she was accountable for driving the company’s strategy; coordinating, leading and expanding all company business divisions; overseeing Disney global franchises including Pixar, Princess, Marvel, and Star Wars; and seeking out new business opportunities in the region. A key focus for Powell has been consumer engagement and creating innovative opportunities for fans to connect with Disney’s stories, characters and brands through both physical and digital experiences. She has led the development of multiple Disney consumer activations with organizations such as the Sydney Opera House, Royal Botanic Gardens in Sydney and Melbourne, The State Theatre, Tennis Australia, and the Australian Grand Prix Corporation. She was also elected to the Chief Executive Women in Australia and serves as a member of the Sydney Opera House Trust. Earlier in her career, she led the Disney Media Distribution division in EMEA; served as Disney Media Distribution’s senior vice president, Sales – UK, Ireland, Nordic, Benelux and Israel; and prior to that, the executive director – Sales, UK and Ireland. Before joining Disney, Powell worked for BBC Worldwide for seven years, holding various senior TV sales roles across the Middle East and Europe. During her career at Disney, her leadership has consistently inspired her teams to deliver results and initiatives that set new benchmarks for success. Powell is seen as a role model to many who have worked with her, and in particular, to other female leaders. “I think it is critical that female leaders have the ability to engage and empower women to believe in themselves and be great at what they do; and to have the qualities of positivity and optimism. Never be afraid of thinking differently and taking risks,” she said. Tricia Wilber is a top strategic leader who is widely respected across global markets. As chief marketing officer for The Walt Disney Company EMEA, Wilber is responsible for the creation, implementation and oversight of Disney’s integrated marketing organization throughout Europe, the Middle East, and Africa. She has been instrumental to the implementation of the ‘one voice, one vision’ model in EMEA, as well as driving partnerships across the region. As a member of Disney’s EMEA executive management team, Wilber helps set the strategic direction for the company, which she ultimately translates into marketing strategies, priorities, budgets, and plans for driving execution regionally and locally. She oversees the franchise management organization, which is dedicated to building and managing regional business plans for key franchises and properties. She also leads Disney Media Plus – orchestrating EMEA’s Advertising Sales business and third party partnerships. During her tenure with Disney, Wilber has held various roles driving significant change from business-led leadership into an integrated approach to marketing and franchises. Her colleagues describe her as a highly respected leader and change agent with an ability to bring people together for successfully driving change in business models. Her well-rounded career has provided her the opportunity to create, plan, market, sell, and ultimately lead business operations that deliver profitable products. Earlier in her career, Wilber was with the Disney Media Advertising Sales and Marketing Group, where she led the structure that drove advertising sales, marketing, and promotions for Disney’s kid-driven and family-inclusive TV platforms, its online offerings, its kid-focused publishing business and its kid-and mom-focused radio and publishing platforms. Her other roles include senior vice president of advertising sales and promotion for Disney ABC Cable Networks Group, vice president of national accounts for ABC Cable Networks Group, and vice president of business development with ABC Cable Networks Group. Wilber said her biggest career move was relocating to London after a career exclusively in the U.S. and taking the CMO job for a region with over 40 countries. “What I learned from it was that there are many important differences between cultures and the way people interpret the same message however, the underlying human characteristics are surprisingly the same,” she said. Direct Eurostar services to Disneyland Paris under threat. The Direct Disneyland Paris train service from London St. Pancras International to Marne la Vallée / Chessy is under threat of cancellation by cross-Channel rail operator Eurostar after they announced a drop in passenger numbers and a fall in revenue. The Direct Eurostar service popular with many visitors to the resort from the United Kingdom departs from London St Pancras International station and arrives at Marne la Vallée/Chessy station at the gates of Disneyland Paris. Eurostar has announced that it will be cutting services between London and mainland Europe and at least 80 jobs will be lost at the company affecting on-board train and station staff, Temple Mills maintenance depot, the Times House headquarters in London and the Eurostar Contact Centre. Eurostar earlier this year said that the vote to leave the European Union had contributed to a “challenging” second quarter of 2016, with passengers numbers falling 3 per cent on the same period in 2015. The Eurostar’s CEO Nicolas Petrovic said at the time it was due to a “slowdown in business travel” thanks to “uncertainty following the vote to leave, combined with the Brussels terrorist attack”. The Transport Salaried Staffs’ Association trade union said the cuts followed a ‘severe reduction in passenger numbers and revenue’ in 2016, which had led to the Eurostar ‘significantly reducing costs in other areas’ before announcing the job losses. Eurostar commenced the Direct service to the resort in 1996 with great fanfare with a special parade in the Disneyland Park featuring Sir Richard Branson and then Euro Disney S.C.A. President Philippe Bourguignon. Sir Richard Branson’s Virgin Rail Group was interested in operating the Regional Eurostar services that would have operated from Glasgow, Manchester, Cardiff, and Plymouth to the resort. Unfortunately these services failed to materialise after competition from low-cost airlines forced the cancelation of the project. Eurostar have been considering cancelling the Direct Disney route for the past few years, and the company took the decision last year to cancel the service between the months of January and February due to poor passenger numbers. When the service originally launched there were two trains a day from London to Disneyland Paris. The service has since been cut back to one train every other day. Eurostar are scheduled to release a new international timetable in December, where 8% of it’s serves are expected to be cancelled. Today Disneyland Paris ended a week of speculation and announced their plans for the resorts 25th Anniversary. “2017 is going to be a really spectacular year at Disneyland Paris as we celebrate our 25th anniversary! We’ll be offering sensational new attractions, a grand celebration with the beloved Disney Characters, a brand new Parade and a breathtaking new night time spectacular. starting from 26th March 2017. New Guest experiences to include sensational new attractions, a grand celebration with the beloved Disney Characters, a brand new Parade and a breathtaking new night time spectacular. Extra surprises and features to be announced. Join the celebration with a multitude of new shows from morning through to night where Guests are sure to be amazed! 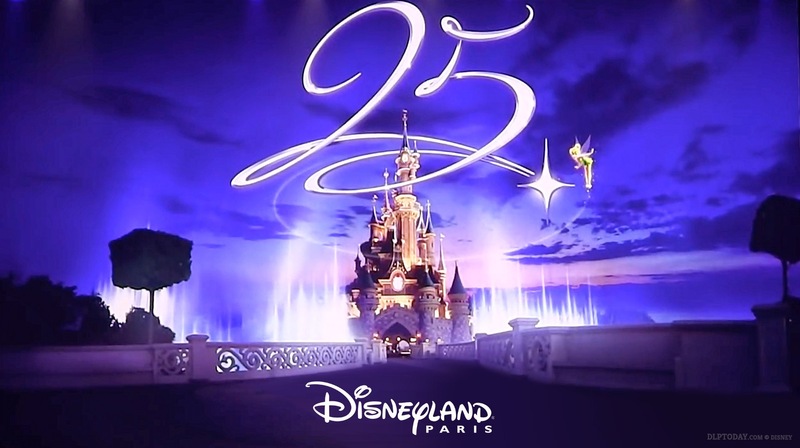 A brilliant anniversary celebration beyond your imagination awaits you during the 25th Anniversary of Disneyland Paris. Beginning March 26th 2017, Guests at Disneyland Park will experience Star Tours: The Adventures Continue. The new attraction will take Guests on an all-new, action-packed intergalactic voyage, all in 3D… Epic. Based on the Star Wars™ films, Star Tours will take Guests to multiple Star Wars destinations where they will interact with characters from throughout the Saga. Every destination will offer unique surprises with journeys through the worlds of Jakku, Hoth, Tatooine, the Death Star and more! Guests will be able to enjoy the attraction multiple times without knowing where the Force may take them. And all of the storyline’s twists and turns will be random, affording Guests the chance to ride the attraction multiple times. Guests will also be able to join the Rebel Alliance by becoming the drivers of Star Wars Hyperspace Mountain (Disneyland Park). The Force will be strong with this attraction, which hurtles through the Star Wars galaxy, following the twists and turns of TIE fighters and an intimidating Star Destroyer. Also arriving in spectacular style in 2017, Disneyland Park’s new Parade Disney Stars on Parade, where favourite Disney Stars, together with stunning new floats, create magic and happiness for all. Guests will also be able to discover a new show Mickey presents “Happy Anniversary Disneyland Paris” at Disneyland Park where Mickey Mouse will start the celebration by assembling as many of his famous Friends as possible for a huge anniversary party. This festive show will take place daily for all guests to enjoy. In addition, fans of the Disney Princesses will be able to witness some of their most beloved Princesses as they host their own sparkling show The Starlit Princess Waltz at Royal Castle Stage (Disneyland Park). Finally, as night falls, there will be another spectacular new event: Disney Illuminations. This new show, with dazzling lights, projections and breath-taking special effects, will be conducted by Mickey Mouse onto Sleeping Beauty Castle (Disneyland Park). It will transport Guests to a location where the stories of Disney’s The Little Mermaid, Frozen and the motion pictures of Disney’s Beauty and the Beast, Star Wars and Pirates of the Caribbean will come to life before guest’s astonished eyes. What do Mickey Mouse and his Friends hope to achieve during these Anniversary celebrations? To dazzle all guests with amazement! This will no doubt be an opportunity not to be missed! 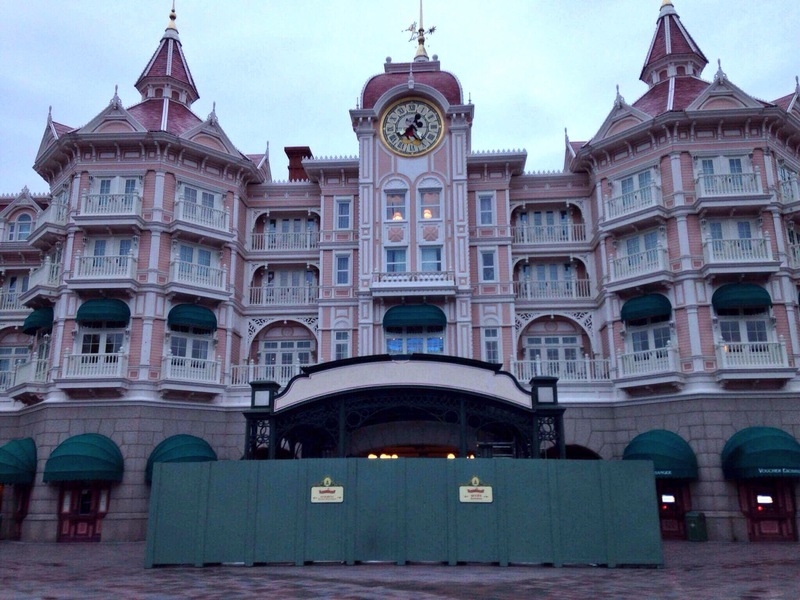 Disneyland Paris 25th Anniversary – It’s Time to Sparkle. Celebrations for the 25th Anniversary of Disneyland® Paris will start on 26th March 2017. Fireworks, parades, certain shows and festivals are on selected dates and are subject to weather conditions and changes. Attractions, entertainment, shows, shops and restaurants may be closed, modified, delayed or cancelled without prior notice. 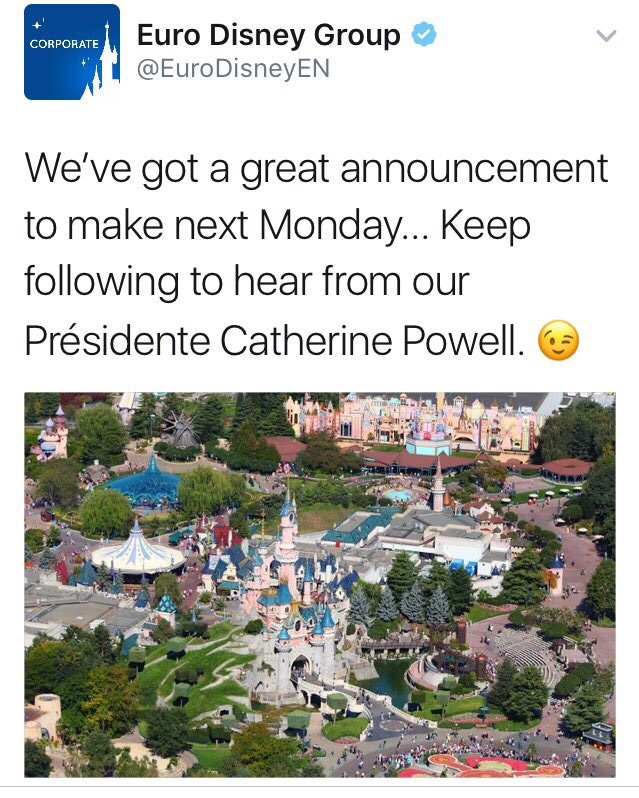 Last week the official Corporate Twitter feed of the Euro Disney Group published a Tweet promising that a big announcement would be made on Monday 17 October 2016. “We’ve got a great announcement to make next Monday… Keep following to hear from our Présidente Catherine Powell”. Since then speculation has grown within the Disneyland Paris fan community on what this announcement could be. Most fans speculate that Monday will see an announcement about the resorts 25th Anniversary celebrations which start next year. But fans being fans some of the rumours appearing on fan forums, Twitter and Facebook following the announcement made last Monday have been quite amusing to read. They include everything from the building of a new hotel, a third theme park, a possible new attraction and even the renaming of the Disneyland Park to the Magic Kingdom. The rumours of a possible name change came about after our friends ED92 Tweeted photographs of the entrance to the park which is presently under refurbishment with it’s familiar Disneyland Paris sign removed. Could the park be re-named? Well its not inconceivable for such a move to be made. The main park was originally to be called The Magic Kingdom, but the name was changed to Euro Disneyland prior to construction. So what will the announcement on Monday be about? My money is on details of the resorts 25th Anniversary celebrations being released. So far the resort has remained very tight lipped about it’s plans to celebrate the parks 25th Anniversary on the 12 April 2017, and with the latest Disneyland Paris holiday brochures about to appear on the shelves of travel agents all over Europe any time now this would make the most sense. October 2016 Trading Pins at Disneyland Paris. Disneyland Paris is preparing for next year already with the latest release of trading pins. October sees nine pins reminding everyone that next year is 2017. Considering that the resort is now celebrating the Halloween season it’s quite disappointing to see that only two Halloween pins are scheduled to be released. Nice to see secure locking pin backs being released this month – I’ve lost count of the number of pins that have dropped off my lanyard over the years and at 7.99€ these are a jolly good investment. 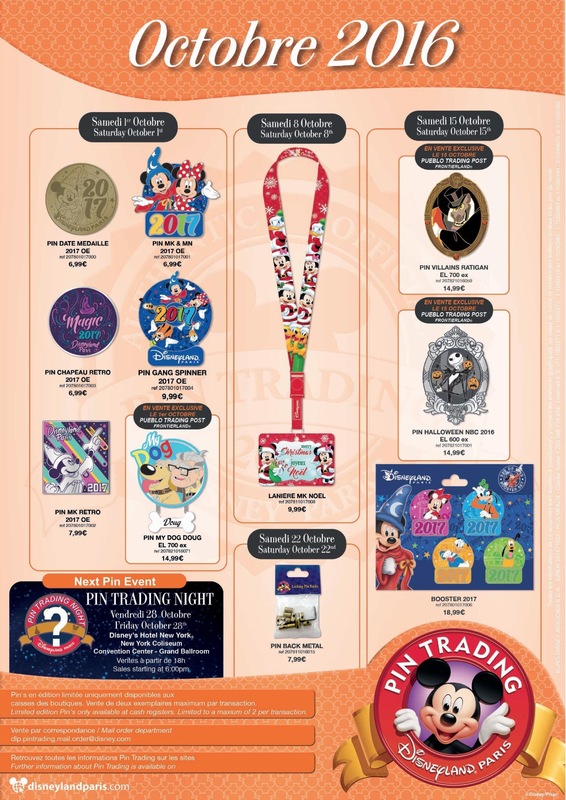 This months Pin Trading Night is being held at Disney’s Hotel New York, Coliseum Convention Center in the Grand Ball Room on Friday 28 October 2016 and the fun starts at 6PM. Disney donates $5 million towards the Notre-Dame rebuilding project. Direct trains from The Netherlands to Disneyland Paris commence operation.